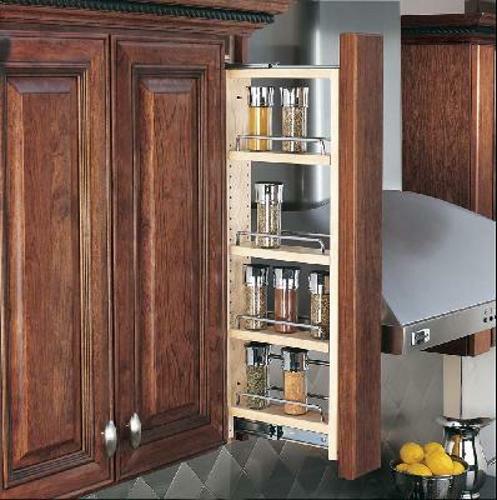 When the time comes to choose between wood and metal drawer slides for your woodworking projects, the intended use of the drawers you are creating as well as the environmental conditions in which they will be used must be considered in order to make the best decision. Although metal slides have a number of advantages and are generally preferred over wood, in certain cases, such as traditional handmade furniture, wooden slides serve as a symbol of true authenticity and fine workmanship. Determining how much weight each drawer will be required to support is important when selecting between wood and metal slides. Although high quality metal slides can support several hundred pounds, they cannot compare to the load-bearing capacity of well-made, hard wood slides. Metal slides will most always have a lower weight capacity than wood slides, especially high quality woods such as oak. Many additional factors also come into play, such as smoothness of motion, the durability of each type of material, mounting configurations, etc., so even if you plan to store heavy objects such as hardware or tools in a particular drawer, wood may not necessarily be your best choice. 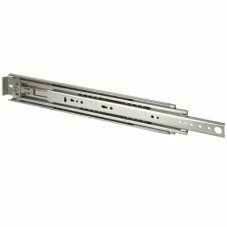 Ball bearings allow metal slides to function in an extremely smooth manner, regardless of how frequently the drawer is used. Wooden slides, when well made and lubricated with candle wax, can approach the smooth feel of metal, but pose more risk of over extension and falling. Metal slides provide over-extension protection, but do so at the cost of the extension loss, which is the difference between the length of the drawer and the slide itself. In longer drawers, an extension loss of a few inches may not create enough inconvenience to feel significant, but if you have a 12" drawer with a 3 1/2" loss, the difference is likely to have more impact. However, extension slides can correct this issue should you decide that metal slides are your best bet overall. Anyone who has ever lived in a humid environment can easily understand how dramatically wood is affected during wet times of the year. When selecting which type of slide best meets your needs, the surroundings in which the drawer will be required to function are some of the most important factors to consider. Binding and distortion of drawers with wooden slides is common as the wood expands in response to moisture in the air, and anything less than exceptional workmanship in the original joinery and positioning will only add to the challenges. Conversely, metal slides are completely unaffected by humidity, providing consistently smooth operation every day of the year. With metal slides, you have many additional configuration options compared to traditional wooden slides. Instead of being limited to center-mounted slides (which can be prone to racking side to side) or side mounted positions, specialty metal slides can provide a variety of mounting options. For example, entertainment centers may benefit from cabinet doors being able to slide out of sight. There are plenty of instances where an alternative to center or slide mounted door slides would be preferred, such as with computer desks. filing cabinets, and more. How Much Time Do You Wish to Invest in Your Project? The nature of the piece of furniture you are creating is likely to impact the amount of time you wish to invest in its creation. For example, if you are constructing dresser drawers and highly value traditional woodwork, wooden slides (despite their drawbacks) will clearly be your best choice. You will need to use extra care ensuring the joinery and positioning of the slides are exceptionally completed, as poorly constructed wooden slides do not fare well with the passage of time. For the majority of other projects, the time saved with the use of metal slides is substantial. It is best to select and purchase the metal slides which will best meet your needs during the design phase of your project, to ensure proper fitting and simplify the installation process. When it comes to woodworking projects of any type, allowing your creativity to guide you will ultimately lead to a much more enjoyable construction experience and consequently, a higher quality end product. Ultimately, choosing between wood and metal drawer slides is a personal choice. For some, the sound and feel of well-made wooden slides more than compensates for any drawbacks. Keep functional considerations in mind, but don't forget to let your creative side have a say in the matter, and have fun! Ball Bearings VS Roller Bearings, What's The Difference?